That little guy on the left was stamped locally, and I shaped the handle out of some sort of European (possibly Czech, but I don't remember) beechwood. I made the mistake of wetsanding the brass hilt with the wood already on, so it discolored the wood to the dusty brown it is today. I keep wanting to make a sheath for it. 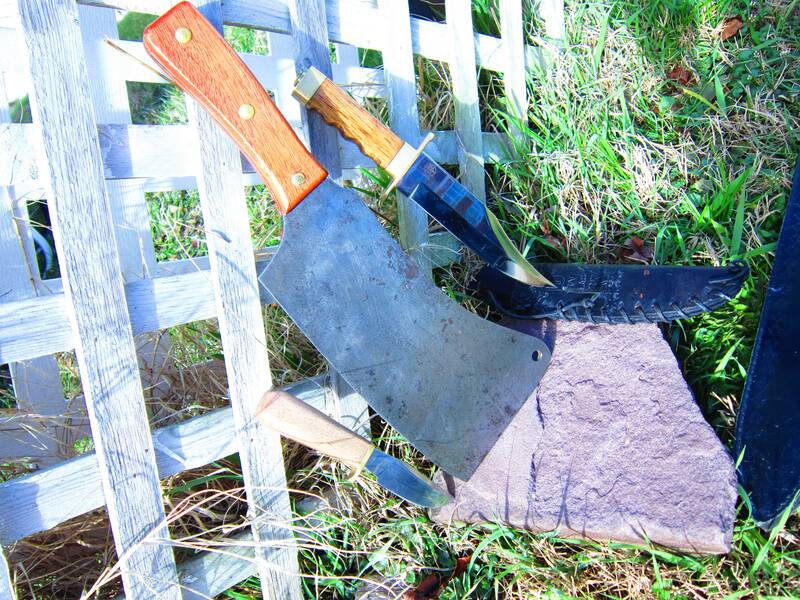 The cleaver in the center is something of a family heirloom. 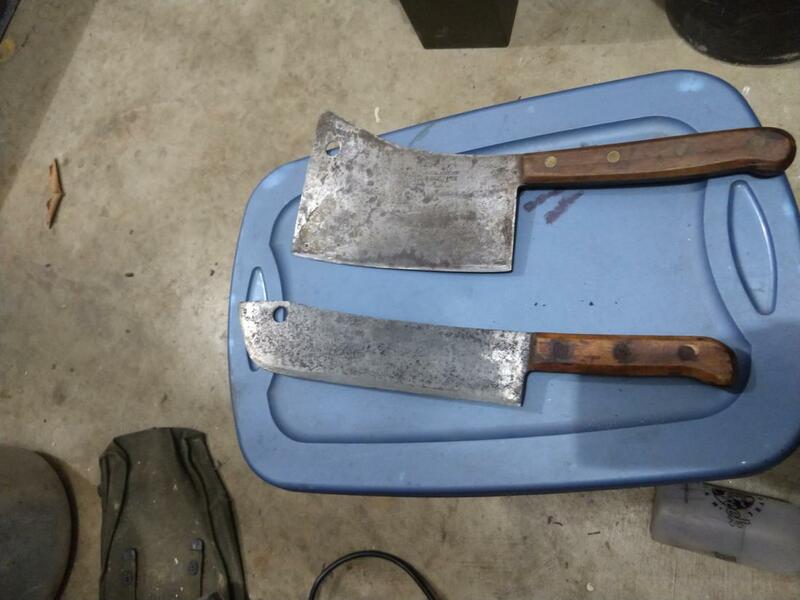 My great-great-grandfather was a butcher and left the cleaver blank (literally a stamped piece of metal in the shape of a cleaver) to my grandpa, who passed it on to me after I'd gotten into knifemaking. The scales are mahogany scraps from the local junior high. 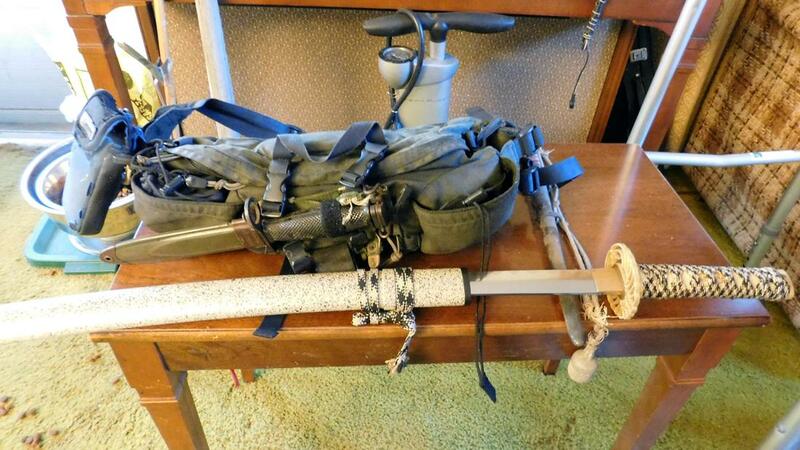 The Bowie on the right was built from a kit, and came with the sheath that it's pictured sitting on. The kit was purchased NOS from a secondhand sporting goods store and dates from sometime between 1992 and 1994. It's a CVA knife, which is a company normally known for making guns (I actually own one of their muzzleloaders), but they did a line of western/mountainman accessories in the late 80's and early 90's. No idea what wood the handle is, but I applied a nice Minwax antique walnut stain to it, then went nuts with a dozen or more coats of spar urethane. I don't collect knives but I have dozens of them! So, this group of dozens... that's definitely not a collection? It's just a small group of knives? Knives are tools and having more than one knife isn't much different than having more than one saw or hammer. Having the tools for the job isn't necessarily a collection. Different tools for different jobs, exactly, I mean you wouldn't use a straight claw hammer for pulling nails if you had a curved claw nearby. (although my real preference is either a flatbar (I have 2) or a J shaped (I have 3). I carry either a Gerber, or Sheffield skeleton everyday, depending which I grab, they are both inexpensive and big enough to do stuff, although neither has a bottle opener! Got a Buck lock blade. Love it. We used to wear em to school if ya can believe that. Middle school that is. had to send my folding hunter back to Buck for a new blade. As it turns out, hammering it through a 2 x 10 isn't that good an idea. Wore that on my belt for a really long time, probably close to 20 years. 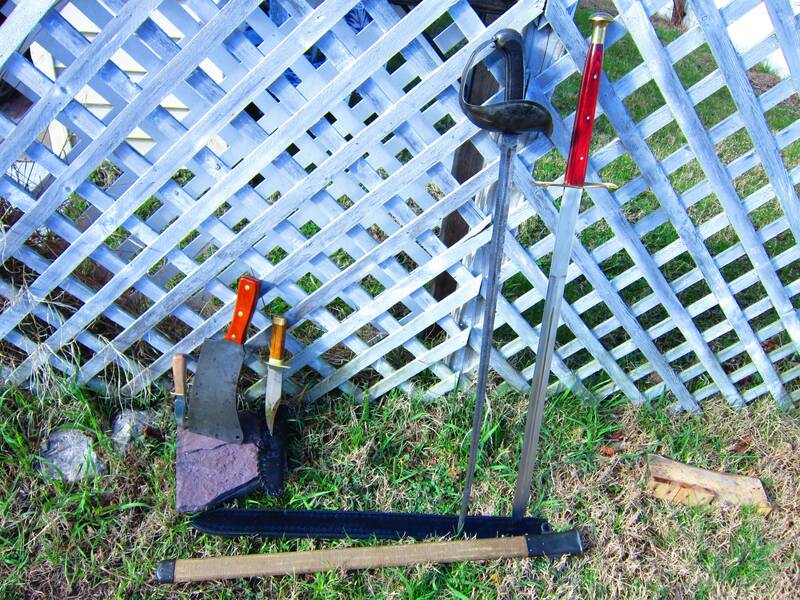 Alas, since I drew the blade of the tanto for the pic, one of my neighbors paid the blood honor. Fare left end, is that a case for Garmin? SNORT!! A repurposed Palm Pilot pouch!! 'Memba dem? Usually holds a cell phone. I have 30 or 40 different knives. I don't really collect them. Last edited by Opus51569; 02-10-2019 at 08:45 AM. I've got a few Kershaw's, CRKT's, Boker's, and Spyderco's. 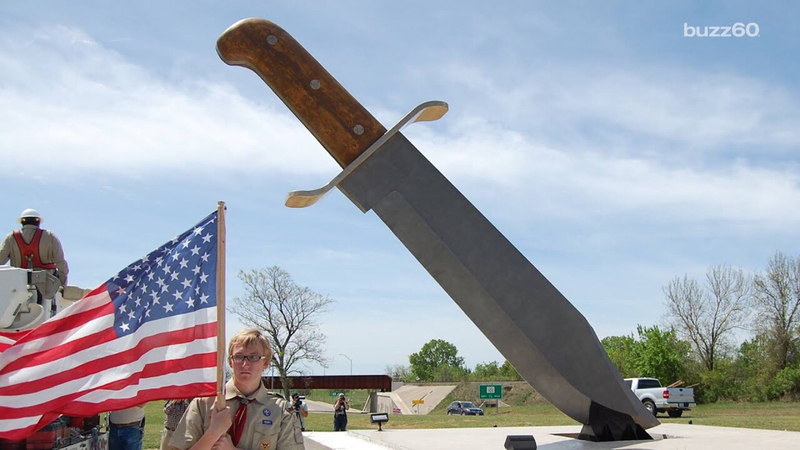 I dream of a custom knife like the one by Stan Wilson in the video... Hearing him explain about matching the bands of Nickel and seeing the invisible lock release @ 10:25 is amazing. I'm still trying to dial my sharpening/honing technique so I also have a few of the higher-end chinese knives and Japanese whetstones. Wonderful and informative video, and thanks. I'm kicking myself. At a gun/knife show several years ago, there was a booth with a bunch of Opinel folders for $15 or $20 or something. They seemed legit; super smooth feeling steel, none of that sticky stainless BudK crap, etched as "Made In France," and @eretz's beech handle. They were there for a few shows, then the vendor stopped showing up, and I didn't get a chance to buy one! @eretz's beech handle. They were there for a few shows, then the vendor stopped showing up, and I didn't get a chance to buy one! I was living in Francois Bellocq territory of Bordeaux at that time with the team Jacque Suire. Raced with his son and a great sprinter in his team, a Spaniard who's family owned a Mercedes dealership. When you sat with this family they all had a personal Opinel, plate side, to our right at lunch, the "meat" before a distant sunset criterium summer months when sometimes sun would set at 22h30. Five bikes on a roof and trunk with a Peugeot 505 turbo diesel considered as nouvelle riche. We were just boys of the vigne.